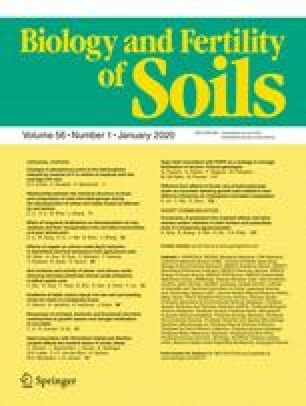 Three cereals (wheat, pearl millet, sorghum), three legumes (mung bean, moth bean, clusterbean) and three oil seed crop species (groundnut, sesame, mustard) were grown in solution culture under conditions of P deficiency and with additions of inorganic P or organic P (phytin, lecithin, glycerophosphates). The plants started secreting acid phosphatase as soon as their roots emerged (24–96 h). The activities of the secreted acid phosphatases increased with plant age and were at a maximum under P-deficient conditions. Phytin increased acid phosphatase secretion to a greater extent than lecithin and glycerophosphate. The increased activities of acid phosphatase secreted under P-deficient conditions when compared with those under P-sufficient (inorganic P) conditions ranged from 2.7 times (glycerophosphate) to 5 times (negligible P, phytin) higher. Legumes secreted the maximum amount of acid phosphatase within 2 weeks after germination, then activity decreased gradually. Acid phosphatase secretion by oilseeds started at a low level and increased with the age of the plants. Only a small increase in acid phosphatase secretion by cereals was observed during the first 3 weeks of growth. The amount of acid phosphatase secreted by legumes was 22% higher than by oilseeds and 72% higher than by cereals. The results showed that an organic P concentration of 250 mg L–1 and above, and an inorganic P concentration <50 mg L–1 provide the most suitable conditions for plants to secrete a maximum amount of acid phosphatase.